Just like that, November is upon us and winter is coming. What a great year we’ve had at Friends of MADACC. This past weekend was our Halloween Puptacular at Urban Bay View. We saw some spooky Howl-oween costumes, for both humans and pooches alike. And this fall, we had some truly great events like Rockabilly for Rescue 2018 held at Kochanski’s Concertina, the 7 th Annual Barktoberfest at Estabrook Park and our Annual Pit Bull Awareness Day Celebration hosted by Camp Bar in Wauwatosa which was the culmination of a month-long awareness campaign. There was also a canine calendar photo shoot [our calendar is now available for purchase], the third community pet clinic of the summer, and a Good Boy Happy Hour hosted by the Plaza Hotel. Wow – in looking back, we have really been quite busy. As we wind down and start to think about planning for 2019, we know that none of these events would have been possible without our wonderful volunteers, our many supportive local businesses always willing to host and encourage us, and all of you. Please know how grateful we are for all of you and just how much we appreciate your unending support. We hope to see you at our next event! 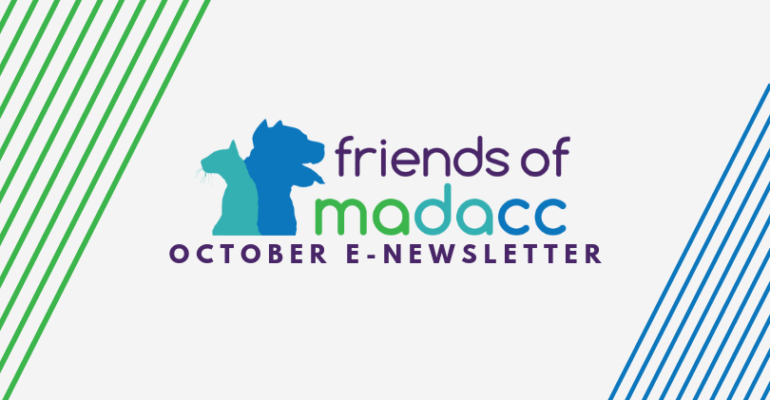 Read the full Friends of MADACC October E-Newsletter.